Here at WorkFlowy HQ we’ve been thinking about how to better enable people to move their lists from elsewhere into WorkFlowy. 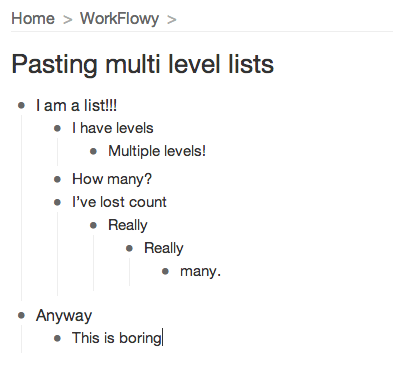 It’s been possible to paste single-level lists into WorkFlowy for a long time – but what fun is that?? The power of WorkFlowy lies in its hierarchical structure! The problem with importing multi-level lists is that there are so many different formats – HTML, OPML, plain text, etc., etc., and many formats come in many variations. We also want pasting lists into WorkFlowy to feel seemless – just copy the list from one program and paste it directly into WorkFlowy. No having to click on menus to bring up a separate box to paste into or anything like that. We decided to start with enabling pasting of normal bulleted lists* like those you’d find in Google Docs. Here’s an example. I have a (very interesting) list in Google Docs that I want to move into WorkFlowy. First I select the list in Google Docs and hit ctrl-c (or Command-C on Mac) to copy it. Then I open up WorkFlowy, navigate to where I want to paste the list, click into the item in which to paste and press ctrl-v (Command-v on Mac) to paste. This is the result. Fancy, huh? We hope this helps you move your other lists into WorkFlowy. More import options will come in the future. * For the more tech-savvy, we specifically support pasting HTML lists that use <ul>, <ol>, and <li> tags. Note that some programs like Microsoft Word and very old versions of Google Docs do not save HTML lists in a sane format, so we currently can’t import them correctly. Update: You can now paste and export OPML as well. It works better than the other options, so try it! This is still less than useful. 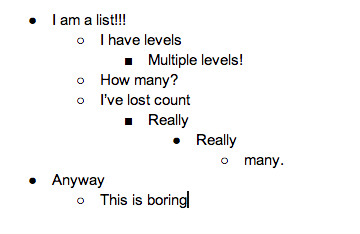 It isn’t possible to paste bulleted/numbered lists from Word into a GoogleDoc, and then into WorkFlowy. Agree. I just came to this (almost 2 year old) page to find that my bullet-point lists in Word / Onenote won’t import. Just paste your notes into Google docs and then into workflow. Pasting from Word is now supported.